There are some beautiful strawberry plants in the shops. 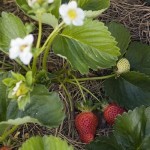 Start a strawberry bed with a square of sixteen plants and you’ll be set for summer pavlova heaven. Or fettle your existing bed with some weeding, feeding and mulching. It will reward your love many times over. I’ve enjoyed another uplifting documentary, this time about a puppeteer.